Incorporation of the City of Duncan In 1912 – Temple Lodge, No.33, Duncan, B.C. The City of Duncan was incorporated on 4 March 1912 and members of Temple Lodge No. 33 were instrumental in making that happen. Before being incorporated, the area that is now the City of Duncan was part of the Municipality of North Cowichan. It was dissatisfaction with North Cowichan which prompted the residents of Duncan, led by members of Temple Lodge No. 33, into political action to dissociate themselves from the Municipality of North Cowichan and create their own City of Duncan. This historical fact should be remembered in the upcoming Amalgamation Referendum which is about whether to reunite the City of Duncan and the Municipality of North Cowichan into a single municipality. Here are some newspaper reports of 1911-1912 documenting the movement toward creating the City of Duncan and the involvement of Temple Lodge No. 33 members in the forefront and leadership of that movement. We have added links to the names of Temple Lodge No. 33 members mentioned in these reports. In June 1911 a group of concerned citizens met in the North Cowichan Council Chamber, at what is now the north west corner of Canada Avenue and Kenneth Street, to discuss incorporation of a new City of Duncan. One of the largest and most representative gatherings of property owners of Duncan met on Monday evening in the council chamber to discuss matters of interest to the town. The question of sprinkling the streets was thoroughly discussed and a committee was appointed to take the necessary steps to arrange for this being done, and also to interview the Council as to the many requirements of the town. The matter of incorporating Duncan was then taken up, and a resolution was passed almost unanimously, endorsing the proposal to incorporate, Mr. McKinnon being the only dissentient. Mr. Dickie was voted to the chair and Mr. Brettingham as secretary for the meeting. The chairman in opening the meeting said it had been called to discuss the advisability of spending a little money to make the town presentable, to improve the appearance of the principal streets by a general cleaning up and adding to the comfort of everybody using them by abating the dust nuisance by sprinkling. He said that everyone would benefit by such steps being taken, and he was quite willing to subscribe towards the expense of any work done in this direction but he left it to the meeting to suggest the best methods to be pursued. Mr. Dwyer, who next spoke said he was responsible for having the meeting called together: he found the dust nuisance very detrimental to his business, and he approached Mr. Whidden, a member to the council, as to holding a public meeting in the council chamber. Mr. Harrison, he informed the meeting, was willing to place a water cart on such roads as it was considered necessary to water. It was open to those present to suggest any action thought desirable. Mr. Dwyer also added that Mr. Whittome had expressed his willingness to contribute his share of any expenses incurred. Mr. A. Peterson expressed the opinion that the Municipal Council could well afford, and ought to make an appropriation towards sprinkling the roads. A new assessment had been made, and the rates considerably increased, and those who owned business portions of the municipality contributed largely towards its revenue in far larger proportion than those who lived in the private streets and they were entitled to just treatment from the Council, and suggested that a committee be appointed to approach them on the subject. Mr. Whidden said that as a member of the council he was only too pleased to do what he could, but that suggestions he had made had been turned down and he did not think the council would do anything towards the matter. He pointed out that if the municipality helped in the matter all those who paid rates would expect their streets watered. Mr. Harrison said he was willing to provide a team [of horses], water cart and man for $2.50 a day to sprinkle such streets and as often as was found necessary. Mr. Marsh asked if the town had the right to take the water for street sprinkling, and Mr. Harris replied that the town had paid rent of hydrants for fire protection only. 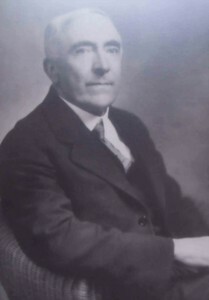 Mr. W. Dwyer said that he had spoken Mr. F. Price about the matter, who had promised to attend the meeting and was in sympathy with its objectives. He did not think there would be any difficulty about the water question. Mr. Peterson questioned Mr. Whidden as to the appropriations made by the council and elicited the fact that appropriations had not yet been made, and he concluded hope to get one for this purpose and for cleaning up the town. Mr. Mutter said that he thought it was most unreasonable the way the town had been held up in regard to incorporation [as the City of Duncan]. He moved that committee be appointed to approach the council on the subject of the meeting, this was seconded by Mr. Whidden and the following gentlemen were unanimously elected: — Messrs. Dwyer, Dickie, W. Gidley, A. Peterson, J. Islay Mutter, J. Rutledge, Marsh, Kibler and Cancellor. Mr. Dickie expressed the opinion that the side streets should be watered as well as the main street, there was dust blowing from these streets and there were business premises on them and the owners of this property were entitled to consideration. He was not in favor of going to the council which, he thought was useless; we must make the town in spite of them until it was incorporated. By watering the streets gravel was saved; the motor cars were wearing the roads away and unless they were I kept watered there would be none left, as nothing was done to keep them in repair. Mr. Kenneth Duncan was asked to explain the steps taken towards incorporation [of the proposed new City of Duncan]. He said that petitions were presented and signed by the leading property owners of the town, but that the council had appeared to obstruct the carrying out of the wishes of the petitioners by putting obstacles in the way which might have easily been removed. However, the Council were now not offering any hindrances, but the petitions and preliminary proceedings would have to be repeated owing to the new assessment roll. Mr. Duncan also explained the further steps that would have to be taken in regard to that portion of the municipality which was to be incorporated. This resolution was carried practically unanimously, there being only one dissentient. A deputation of the City Improve­ment Committee waited on the [Municipality of North Cowichan] council at their last meeting and laid before the councillors various propositions and suggestions for consideration. The deputation, which was a decidedly strong one, was courteously received and at the conclusion of the hearing the impression was apparent that its effect had been beneficial to the interests of the town generally, and that its object was for the mutual benefit of all those who frequented the town either for business or domestic purposes. Mr. Dwyer as chairman of the committee prefaced the objects of the deputation which had been selected as a committee appointed at a public meeting of property owners in Duncan to see what could be done in the way of improving the appearance and comfort of the town. Mr. A. Peterson also spoke, asking if the council would appropriate $150 towards the outfit for watering the streets, when the committee would be responsible for any further expenditure. In regard to loaning the hose for watering purposes, Mr. Anketell Jones, on behalf of the Council, thought that it would be spoilt if so used. Mr. Rutledge brought up the matter of the disposal of refuse, and pointed out the inconvenience existing in there not being a public dumping ground; Mr. Cancellor also spoke on this matter. Mr. Mutter urged upon the council to give a prompt answer as the meeting which had appointed the committee considered that time was important, the nuisance from dust becoming greater daily. 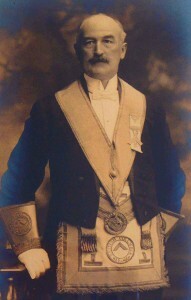 The reeve [note: the Reeve of North Cowichan in 1911 was Alexander Chalmers Aitken, a member of Temple Lodge No. 33] in reply said that the deputation would receive an answer that evening, he would first like to discuss it with his councillors. Mr. Anketell Jones referred to the finances of the municipality and said that some people in the district were without roads at all. 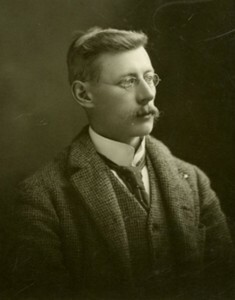 The reeve said that he would be glad to meet the committee on the matter of the dumping ground, but the difficulty was to procure a suitable spot. Mr. Dickinson said that the Indian Agent had absolutely refused to allow any dumping on Indian reserve land. Mr. Dwyer asked why the school rate was included in the total amount on demand note, and not detailed separately, and Mr. Dickinson explained that the omission occured [sic] in the first place through a typographical error on the demand note, and secondly that lack of time had prevented him from filling in the details of this note, but that it was correctly analyzed in the rate book which-was open to every ratepayer to see for himself the particulars he desired. Mr. Dickinson added that this was the first time the rate book had been made up in detail. Mr. Dwyer expressed his complete satisfaction with the explanation offered. Another important point touched upon was that mentioned by Mr. Dwyer in regard to the position of Gen. Rice’s house at Maple Bay. This house, we are informed, encroaches on a public road that has been used for over thirty years and from the position it occupies is a danger to public safety. It is not intended to impute to the owner of this property any intentional disregard of public rights; it is simply a case due to the boundaries of the road not, having been defined an error of the past for which someone must suffer when time alone shows the importance of these omissions. The council assured the deputation the matter would be enquired into. The creamery crossing was next discussed; this will grow in importance as the town extends, for the present position of the station and yard limits, have the effect of inconveniently forming a barrier between the two parts bisected. Mr. Anketell Jones told the deputation that the C.P.R. absolutely claimed the crossing as private property, and even if they did not, he pointed out that the railway commissioners would condemn it as unsafe. There is no denying that this is the case, for the increase in freight cars shunting; within the yard limits has been patent to all lately. The reeve said he would like to have the feeling of the citizens as to fighting the railway company on the question. Mr. Islay Mutter pointed out that the crossing had been used for over 20 years. A meeting called by the Secretary of the Duncan Board of Trade for the discussion of matters of importance to the welfare of the town and district was held in the Council Chamber on Monday evening, and the large attendance showed the interest being taken in these matters. Amongst those present were: Mr. W.P. Jaynes in the chair, Messrs. K. Duncan, W. Dwyer, Campbell, Aitken, McKinnon, A. Peterson, Kier, I. Mutter, W. Peterson, Gidley, Dickinson, J.C. Norie, Hanham, Weeks, Henderson, Robinson, Hall, Hattie, Perry, Martin Smith, Parker, Christmas, Thompstone etc. After the minutes of the last meeting were read and confirmed, the election of officers for the ensuing year resulted as follows: Honorary President, W.H. 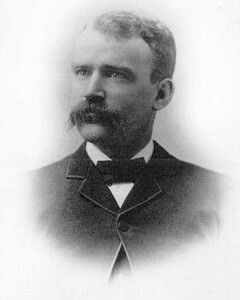 Hayward M.P.P., President, W.P. Jaynes, Vice President, K. Duncan, Council, A.W. Hanham, Dwyer, A. Peterson, I. Mutter, Perry, Whittome, Peterson and five members of the Municipal Council. Regret was expressed that Mr. Peterson had to give the Secretaryship on account of the pressure of other business, and Mr. J.E. Hall having declined same, Mr. Thompstone consented to take it for a year if he was supported by the council. It was decided that those who wished to be members of the Board of Trade should pay $ 1 entrance fee and $4 per ann. payable quarterly, and that all arrears be remitted. The chairman read a letter from the Saturday Sunset re: an article on Duncan, illustrated with numerous cuts, but it was thought that an illustrated pamphlet specially written and published would be of more use and the council were empowered to take this matter up as early as possible, as there were enquiries every day for information regarding the district, and that at present moment there was no literature available. Mr. Dickinson showed the meeting one or two examples got up by other places. 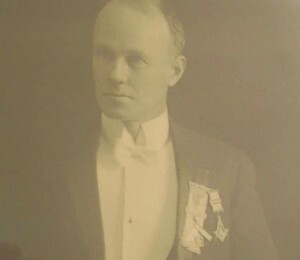 Mr. Peterson brought forward the matter as regards roads in the district and it was decided to approach the [provincial] government, that instead of opening up new roads they should devote more attention to putting the present roads in a proper state of repairs and especially that portion of the Trunk road between Duncan and Cobble Hill. It was also decided that council take some action in running a commercial telegraph in the district apart from the railway one. Mr. Jaynes reported that he had written to Mr. Sperling of the B.C.E. [note: B.C. Electric, the privately owned forerunner to the present day B.C. Hydro] pointing out the advantages of extending their power and light to Duncan but had not yet received any reply. Mr. Peterson asked for information as to who was responsible for the condition of the wharf at Maple Bay and it was decided that the council approach the Provincial Government to have same put into proper repair. Some discussion took place as re­gards the Creamery Crossing but it was decided to leave same in hands of the reeve and council. “The Board of Trade have lately been going into the question of the incorporation of Duncan as a City Municipality instead of a Rural Municipality as heretofore. The place is growing fast and it is evident that it is rapidly out­growing the present system of municipal government. At the present time the Muni­cipal Council have control of a very large district, and without casting any reflection on their efficiency as a body, it may be said that the time is approaching when a system of some more central form of municipal govern­ment will be expedient for the furthering of the best interests of the town. At the present time consider­ably more than fifty per cent, of the members of the council are elected to their position as representing ratepayers who have no very intimate interest in the actual town of Duncan itself. If the town were incorporated as a city municipality all affairs con­nected solely with the adminis­tration of the land and property within the area incorporated in the new municipality would come before the Mayor and Council and every member of that coun­cil would be most intimately in­terested in any proposed bylaw or municipal work. Under gov­ernment by a rural municipality the very important question of the drainage of the town could not claim the same amount of interest from the rural council­lors representing the outlying parts of the district as it could claim from those who actually reside within the town limits. Under government by a city municipality this would no doubt be one of the very first problems to be taken up. A petition is now being circulated in connection with the matter of the incorporation of Duncan as a city municipality. It is necessary that the petition obtain the signatures of the owners of over fifty per cent of the assessed value of the property within the area to be incorporated in order that the incorporation may be sanctioned by the Government. There are a good many points on which people seem to have erroneous ideas with regard to incorporation. There is an idea that the taxation may be increased without the mandate of the people. This is not so by any means. Any increase of taxation will depend entirely on the wishes of the people themselves under the new form of government. Again, it will be neces­sary to have a two-third majority be­fore the city can borrow money for improvements, etc., so that; in this respect also the people themselves will have entire control of the finan­ces of the city. Last Friday evening the 8th Dec­ember a meeting of the citizens of the proposed city of Duncan was held in the Municipal Council chamber. Although the meeting was only advertised for a couple of days a large number of people attended and the council chamber was crowded to the doors. The meeting elected Mr, W. R. Robertson to the chair and Mr. Kenneth Duncan was appointed secretary. The chairman called on Mr. Duncan to explain the objects of the meeting and to define the boundar­ies of the proposed city. Mr. Duncan stated that the object of the meeting was to go into cer­tain matters which would affect the new city in connection with property at present .owned by the Municipal­ity of North Cowichan but which was situate within the city limits. After Mr. Duncan’s speech, a short discussion following and it was eventually decided that a committee should be appointed by the meeting, to treat with the Municipal Council on the matters under consideration. Mr. Duncan explained that the meeting had been called on the ad­vice of the solicitors both of the city and of the municipality. It was moved by Mr. Blythe that a committee of five be appointed for the above purpose and that it should be vested with powers to deal with all questions concerning the property of the municipality situate within the city limits. The committee ap­pointed consists of the following; K. Duncan, A Peterson, J. I. Mutter, J. McL. Campbell and A. Blythe. Mr. Dickinson, Clerk to the Municipal Council explained the situation as it affected the school property. He instanced the case of the city of Chilliwack. At the request of Mr. Pitt, Mr. Duncan explained the steps which had been taken up to date. He an­nounced that by the commencement of the new year everything would be in readiness for the incorporation of the new city to take place. The chairman called on the meeting for suggestions for the guidance of the committee. The question of whether the city should– work under a ward system or not was touched upon by several ratepayers. In this connec­tion Mr. Dickinson pointed out that under the charter, the first election must take place from the city at large, and that therefore if they went in for the ward system, the divisions must be made subsequent to the first election. Another matter which came in for some discussion was the school ques­tion. The Clerk to the Council pointed out that in order to keep the schools open, it would be necessary for the city and the Municipality to come to some arrangement by which children from outside the city and from inside the city might use the schools, otherwise there would not be enough pupils to keep them open. Towards the close of the meeting a few questions were put as to the position of the Waterworks Com­pany. Various speakers stated that the change from the Municipality to the city would not in any way affect the present water supply. The com­pany was bound by its charter to whatever body took the place of the Municipal Council. The matter oi the recreation grounds was mentioned, and it was thought well that this matter should be discussed by the committee too. 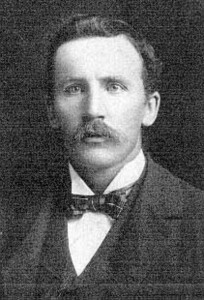 In January 1912 a deputation from the proposed City of Duncan met with the Attorney-General of British Columbia about the Incorporation of the City of Duncan. The deputation consisted of Temple Lodge No. 33 members: Andrew Hans Peterson, James McLeod Campbell and Kenneth Duncan. The local M.L.A. 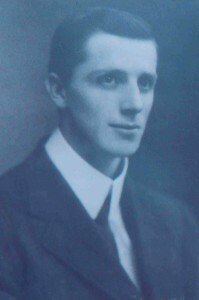 William Henry Hayward, also a member of Temple Lodge No. 33, played a major role. “On Tuesday last a deputation re­presenting the incorporators of the City of Duncan went to Victoria in order to interview the Attorney-General and impress on him the urgent necessity of the incorporation of the City of Duncan. The deputa­tion consisted of Messrs. A. Peterson, J. Campbell and Kenneth Duncan. They were accompanied by Mr. A. Maclean, representing the incorpor­ators; Mr. C. F. Davie, representing the Municipality and Mr. Taylor K. C. representing the Duncan Waterworks. 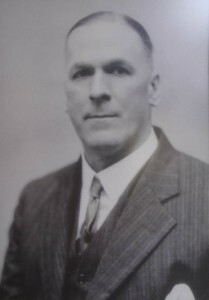 The deputation was introduced to the Attorney-General by Mr. W. H. Hayward M.P.P. and was well received. The object of the visit of the deputation was to see if there was any reason which now held back the incorporation of the proposed city and to inform the Attorney-General that a complete agreement had been reached between the three parties represented, and farther to assure the Attorney-General that all parties were satisfied that all matters outstanding between the Municipality and the proposed city had been satisfactorily adjusted. The Attorney General was satisfied with the con­tentions of the deputation and stated that Letters Patent would be granted for the incorporation of the new city without further delay. Nomination day for the office of Mayor of the City of Duncan brought forward only one candidate namely Mr. Kenneth Duncan who was thus elected first Mayor of Duncan by acclamation. As is well known, this city is named after Mr. Kenneth Duncan’s father, Mr. W.C. Duncan, who arrived here in 1862 and was, of course, the first settler to be estab­lished here. It is fitting, therefore, that the first mayor of the newly created city should be a Duncan of Duncan and we may rest assured that the administration of the affairs of the city will be in capable hands under his guidance. The nominations for Aldermen of the city brought forward a number of names of prominent citizens. The nominees are as follows; W. Gidley, O. T, Smithe, E. F. Miller, J. Camp­bell, A. Peterson and A McKinnon. There are four aldermen to be elected. We will be adding more contemporary newspaper reports in the next few weeks.